Challenging operating conditions and weak consumer sentiment continued to weigh on the performance of Sri Lanka’s premier blue chip John Keells Holdings PLC during the December quarter (3Q19), despite the positive performance of some the group’s business segments, the interim financial accounts released to the Colombo bourse yesterday showed. 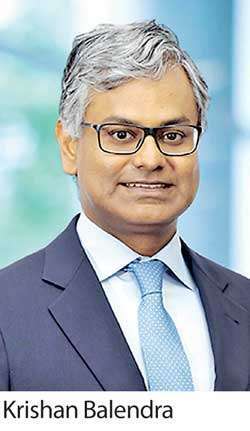 The diversified conglomerate, which has interests in transport and logistics, consumer foods, retail, leisure, property development, financial services and information technology reported 17 percent year-on-year (YoY) growth in the top line to Rs.36.5 billion for the quarter under review, while the cost of sales rose by a faster 20 percent YoY to Rs.29.2 billion. The group earnings before interest, tax, depreciation and amortisation (EBITDA) was at Rs.5.85 billion, which is an increase of 2 percent over the Rs.5.74 billion recorded in the corresponding period of the previous financial year. The operating profit was Rs.1.77 billion for the three months, down by 26 percent YoY as group-wide overheads were higher compared to last year. Selling and distribution expenses rose the highest, by 46 percent YoY to Rs.1.66 billion, indicating that the group spent heavily on advertising across its businesses to maintain its top line under the challenging operating conditions. The group made earnings of Rs.3.46 a share or Rs.4.8 billion for the period, up 7.0 percent YoY, with the help of a heavy deferred tax reversal, which propped up the bottom line. Meanwhile for the nine months ended in December 2018, the group reported earnings of Rs.8.71 a share or Rs.12.1 billion, up 9.0 percent over the same period last year. For this period, the group reported revenues of Rs.99.2 billion, up 13 percent YoY. The group EBITDA for the first nine months was at Rs.14.6 billion, a decrease of 2 percent over the EBITDA of Rs.15 billion recorded for the corresponding period last year. JKH share ended 40 cents or 0.25 percent down at Rs.157.90 at yesterday’s trading close. A performance analysis of the group’s business segment shows that despite being a corporate monolith with its tentacles in a number of business segments, JKH could not escape the vagaries of the economy and the countries volatile politics. The group’s transport business performed well largely on account of the ports and shipping business, South Asia Gateway Terminals (SAGT). The calendar year 2018 marked a significant milestone for both the Port of Colombo and SAGT, handling an all-time high of over 7 million TEUs and 2 million TEUs respectively. The group’s consumer foods business was affected primarily due to the 23 percent decline in volumes in carbonated soft drinks due to the sugar tax. However JKH said its frozen confectionary business recorded a volume growth of 7.0 percent during the quarter under review, driven by the growth in the impulse segment. The group’s retail business, which runs 91 Keells supermarkets with four new outlets opened during the quarter under review, saw its profitability being impacted by one-off re-fitting and re-branding costs. “As planned, the refitting and rebranding of all outlets were completed by November 2018. The new ‘Keells’ brand was formally launched during the quarter under review. The new brand has been very well received and we are confident that it will continue to drive footfall in line with our expectations,” said the group Chairman and Chief Executive, Krishan Balendra who took over the leadership on January 1, 2019. The customer footfall at the supermarkets has recorded a growth of 4.2 percent, which contributed towards a modest 2.4 percent growth in store sales, despite the subdued macro-economic conditions, which resulted in the contraction in average basket values. The group’s leisure sector business was impacted by the dampened performance of the city hotel sector due to intense competition and political volatility, which restricted, in particular business travel to the city, JKH said. Operating profits of the Sri Lankan resort sector recovered during the quarter, but the earnings were impacted by exchange losses on the foreign currency denominated debt. But the company said it would off-set such losses from the foreign currency denominated revenues earned by this segment with the benefit from a weaker rupee. Under the property segment, JKH said the construction of the group’s flagship project, Cinnamon Life, is progressing with encouraging momentum while other residential projects too are on schedule. “The super structure of ‘The Suites at Cinnamon Life’ has been completed whilst all other buildings are also nearing completion. The installation of the mechanical and electrical services, the external façades and the internal works are now underway. Preliminary construction work has commenced on the 891-apartment joint venture residential development project, ‘Tri-Zen’ in Union Place, Colombo. The piling work at the site will commence in February 2019. Pre-sales for the project continue to be encouraging. We expect to commence revenue recognition on this project from the June 2019 quarter onwards,” Balendra said. Meanwhile, the group’s financial services businesses, mainly consisting of its life insurance company Union Assurance PLC and Nations Trust Bank PLC, reported subdued performance. “Whilst Union Assurance PLC recorded an encouraging growth of 12 percent in gross written premiums, profitability was impacted by marked to market losses on its portfolio of equity investments. Whilst Nations Trust Bank recorded an improvement in net interest income and steady loan growth, profitability during the quarter under review was impacted by the introduction of the debt repayment levy,” Balendra added. Meanwhile, a notable change in the JKH’s ownership structure as at December 31, 2018, was the increase of Harry Jayawardena controlled Melstacorp PLC’s stake in JKH to 8.4 percent from 3.5 percent three months ago. High net worth investor S.E. Captain had also upped his stake in JKH to 10.9 percent from 10.3 percent while Broga Hill Investment Limited, a vehicle of Malaysia’s sovereign wealth fund Khazanah held 10.2 percent stake. JKH does not have a controlling shareholder and public shareholding as at December 31, 2018 stood at 98.53 percent.